A steadily growing middle class with solid income and a upcoming awareness for health prevention and medical treatment. Hospitals, medical facilities and medical centers are build throughout the country. The government is currently investing huge amounts in medical infrastructure and private investors seek for opportunities to invest in the market of privately operated hospitals in Indonesia. 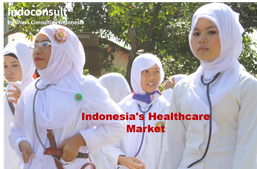 Indonesia is one of the rising markets for health and medical equipment in SEA. Considering the growth rates of the population, the increasing awareness regarding modern medical treatments, diagnostics and medial prevention in combination with a increasing income of population, Indonesia is the key-market in SEA to take into focus when expanding business. The implementation of a nation wide governmental health insurance program (BPJS) in 2014 supports the increase of investment in hospitals, local clinics and medical practitioners as far as the BPJS program also offers financial support for the investment into new facilities, diagnostic and therapeutic equipment as well as the extension of hospitals into new sectors (such as laboratories, nuclear medicine, cardiac centers). The current market value of healthcare and medial equipment sector is estimated to be about US$ 25 billion. It is expected by market experts that this will double by 2020. Indonesia is currently having approx. 2.000 general hospitals and 600 specialized hospitals as well as approximately 10.000 communal health centers (Puskesmas) spread out trough the archipelago. The large scale general hospitals are located in any major city of Indonesia and cover all medical and diagnostic areas. Over 600 specialized hospitals are mostly located in the larger urban areas and offer various services from cardiac centers, surgery, orthopedic centers to facial and plastic surgery and beauty services. The community health centers are mostly equipped with the basic medial services set such as dentist, small surgery centers, radiology. The Puskesmas are the backbone of rural healthcare in Indonesia. Private held and invested hospitals are part of the above mentioned 2.600 hospitals (approx.. 25%) and play a major role in Indonesia especially for the middle and upper class who desire for medical treatment and a higher level. Those private held hospitals invest huge amounts in state-of-the—art medical equipment, professional training and modern infrastructure to suite their patients demands. Visiting a private hospital is not only a matter of better medical treatment but also a status symbol for Indonesians. The healthcare market is expected to grow to US$ 50 billion by 2020 whereas the medical device market is nearly US$ 1 billion with an annual growth rate of 15%. Most of the medical equipment has to be purchased outside of Indonesia as far as Indonesian manufacturers only produce basic equipment such as disposable supplies, hospital beds etc. Most of the medical devices in Indonesia are either originated from the USA, Germany, Netherlands or Japan. Russia becomes a increasing market player within the last years supplying laser devices, small radiology devices and laboratory equipment. The importance of the healthcare market is also displayed in demographic figures. Indonesia with its more than 250 Mio. Inhabitants, an annual population growth of 1,2% and an increasing life expectancy (currently 68,7 years – 63 years in 1990) and the increase of lifestyle disease such as diabetes, cancer, asthma, COPD, heart diseases, metabolic disease makes the healthcare sector to become more important within the next years. Another important fact is the culture change in Indonesia with the last decade. Indonesia is a country where the population relied strong on traditional local medicine, alternative therapy or even spiritual healing measures. The change from a rural to a more and more urban society oriented on western lifestyle slowly leads to a backdrop of these traditional healthcare and puts a higher focus on modern medical diagnostics and treatment. However Indonesia has be also seen in the light of being one of the countries with the highest bureaucratic and administrative hurdles in the world. This hurdles also apply in the healthcare sector and affect foreign importers and investors in many ways. Each medical device or equipment to be sold or used in Indonesia has to be registered in Indonesia to obtain a so-called AKL-Number. This number applies for small disposal from a siring up to a MRT. The registration process is lengthy and several important steps have to be followed in order to get the AKL-Number. Without such a number no medical product will be allowed to be used in Indonesia. A second issue are the import requirements. Indonesia only allows brand-new equipment to be imported. For more information about the registration process, read our latest blog post. To summarize the above said, Indonesia is a steadily growing market for healthcare and medical devices. The supply of medical equipment and devices is strongly depending on imports from other countries. The investment in the healthcare sector is on one side strongly driven by the government to improve public health and also by private investors who play and important role in the local health market. Several restrictions and administrative regulations have to be followed in order to import and distribute medical equipment in Indonesia and licenses and permits applications are taking long time in Indonesia. However the market is offering many opportunities for foreign suppliers and investors and once the administrative and bureaucratic hurdles have been mastered a prosperous business can grow in Indonesia. If you would like to enter the Indonesian market, explore the opportunities or establish business in Indonesia Indoconsult is your partner. We support you with market research, business development, regulatory affairs, sales force, company incorporation and more.